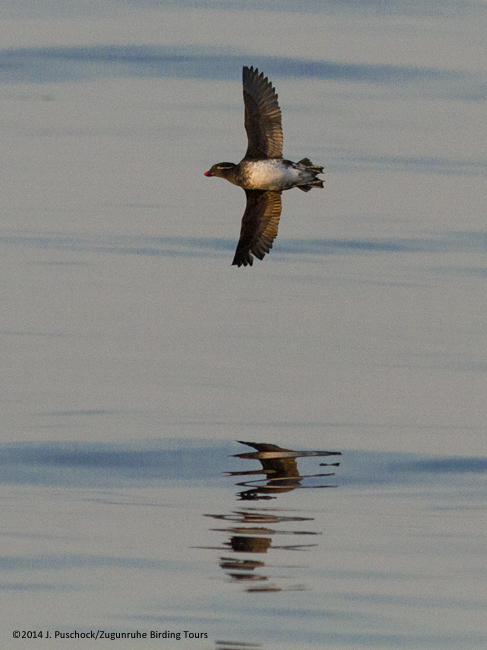 After scoring the Pin-tailed Snipe on May 31, we had renewed hopes for the second week of Zugunruhe‘s Attu trip. The weather forecast was still poor for bringing more vagrants (east winds and no low pressure systems passing near the island), but a Code 5 species arrived under those conditions, so maybe there would be more. Alas, it was not to be. We did see some more Asian species, but only a few and none nearly as rare as the Pin-tailed Snipe. On June 1, Doug Gochfeld and Bill McConnell had an adult Slaty-backed Gull fly past them at the Japanese peace memorial, an unexpected location. On the same day, a Common Snipe was displaying next to the main runway. Several Goosanders, the Old World form of Common Merganser, were seen off and on. Just like the Siberian Whimbrel, these birds will create a bigger stir if and when they’re split from the New World subspecies. Meanwhile, the Steller’s Eider was still in Casco Cove, and a few Aleutian Terns arrived on June 2. Overall, bird numbers seemed to be down from last year. We had great luck in 2013 when a storm brought us our largest fallout of Asian vagrants yet, but numbers of expected species seemed lower this year as well. One of the few exceptions was Snowy Owl. There were at least four pairs around the greater Massacre Bay area. This year seemed to have a never-ending supply of complications. June 2 brought another one. We were on the island for less than an hour when a radio call came from the boat. The captain had just received the weather forecast, and it was calling for a gale from the southeast. Normally, Casco Cove is great place to anchor a boat, except when there’s weather from the southeast. We needed to return to the boat and relocate to the northeast side of the island to wait it out. It wasn’t all bad. Along the way, we saw some orca. We birded the Holtz Bay and Chichagof Harbor areas. There were a few Tufted Ducks around, but we didn’t find anything new to add to the trip list. Conditions improved, and we returned for another day of birding the Massacre Bay area on the morning of June 4. The birding was pretty much the same as before, with a few Goosanders being the most notable vagrants. Sometimes you just have to work with what you have, and that afternoon we got serious about making some lemonade from the lemons that were at hand. Splitting up into two groups, we cruised Massacre Bay on our skiff. 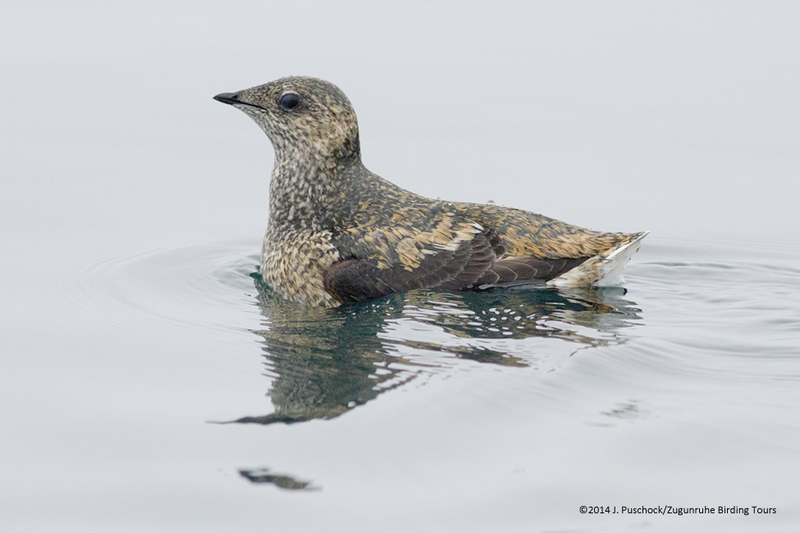 The first group spent some quality time with Marbled, Kittlitz’s, and Ancient Murrelets. (Side note: One of the best bits of dialog from the trip was “Ancient Murrelet?”, “No, but it’s old.”) I was in the second group, and we had an incredible up-close-and-personal experience with a Kittlitz’s Murrelet, followed by a flyover from a Snowy Owl coming in from the sea with a full crop. This Kittlitz’s Murrelet gave us an impressive show. Meanwhile, there was no hope of fixing the Puk-uk’s transmission problems. We were able to get around by idling, but there was still a chance that the problem could get worse. The M/V Tiglax, the Alaska Maritime National Wildlife Refuge’s ship, was in the area, and it was decided that it would be safer for us to return to Adak aboard that ship instead of the Puk-uk. If the Puk-uk’s transmission would totally go out, the US Coast Guard would only have to rescue three people instead of over a dozen. (As I write this, the Puk-uk is still going, actually making better time than we did on the way out to Attu, and about a day from Dutch Harbor. After taking a few days off, the crew will take her back to her home port, Homer, if possible.) I owe the crew of the Tiglax a big thank you. I can’t say enough good about them. They went above and beyond and made us feel more than welcome. We had to leave a little early, losing our final day of birding at Attu, but we got to stop at a few seabird colonies on the way as researchers were shuttled between islands. One highlight was getting to see Buldir up close. With over 20 seabird species breeding on the island, it’s the most diverse seabird colony in the Northern Hemisphere. Without official business on the island, boats have to stay three miles away due to restrictions related to Steller’s Sea Lion rookeries on the island, so this was my first chance to see it up close. While there, we got to watch a number of Red-legged Kittiwakes flying by. However, the light was poor, and even though I got a few frame-filling shots, the photos from this stop weren’t great. I still consider this species to be a photo nemesis. 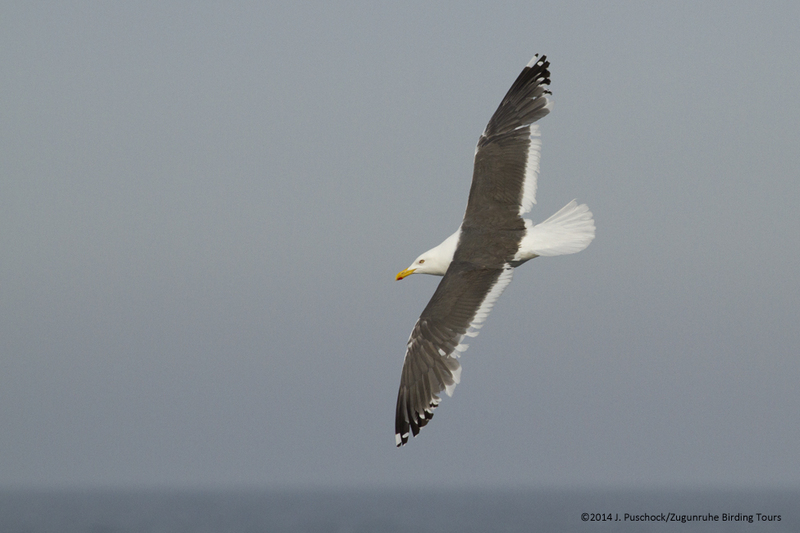 Oh, we also had a few more Short-tailed Albatross and one or two Mottled Petrels between Shemya and Buldier. Unfortunately, the petrels were distant. The following morning, June 7, found us at Gareloi at sunrise. Millions of Least and Crested Auklets breed here. A few Parakeet Auklets are mixed in with them. Parakeet Auklet at Gareloi Island. As you can see, it was a beautiful sunny day. The winds and sea were calm. The air was warm. A great day for sailing. Further on, we encountered a pod of four sperm whales. 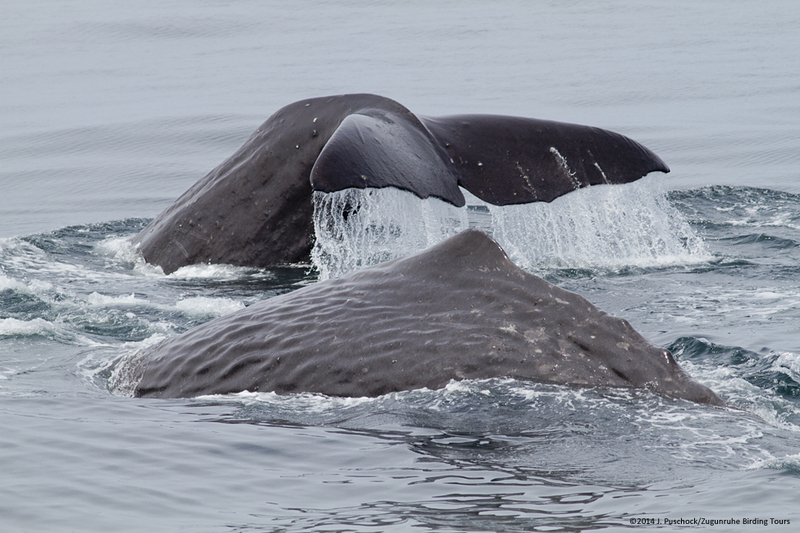 These whales are fairly common in the Aleutians, but this was the first time I’ve seen a group of them. Two of four sperm whales. In the early evening, we passed a pod of orca on the north side of Adak, and then not too long after that we were back in civilization. And this is where the story gets a little weird. After settling in our lodging (three housing units — two together in the main part of town and one on the north side), most of us went to the town’s drinking establishment, the Aleutian Sports Bar And Grill (known more popularly by the acronym formed by its name). Besides the bartender and cook, there was just one other person in the bar when ten of us birders walked in. I hope we didn’t intimidate them too much. After some small talk, a couple of games of pool, and placing orders for food, the other patron swiveled around in his chair and said, “Oh yeah, someone said there was a cuckoo just north of here.” Dumbfounded, we weren’t quite sure what to do. We pressed him for some more details, but he didn’t know anything more. The other guides, Jess Findlay and Doug Gochfeld, decided to do some exploring while the rest of us waited for the food, expecting this to be a wild goose chase. 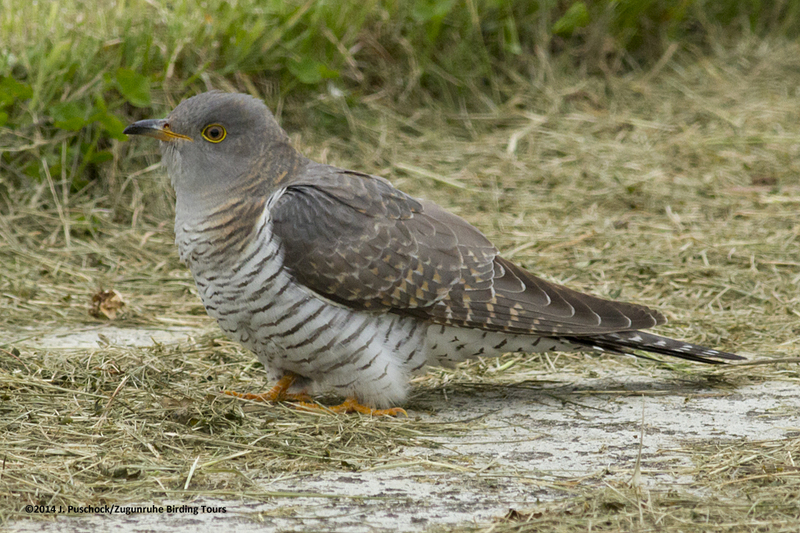 It turns out they were just about to give up when they found a hepatic morph Common Cuckoo on the last street they drove down. Most everyone runs out, but I now have a dilemma. My chicken strip basket (with tater tots!) just came out of the kitchen. “Can I take this with me?”, I ask the bartender. We’re on the road for the one-minute drive to the cuckoo. With the flight back to Anchorage not leaving until 6 PM on June 8, we still had most of one more day to bird Adak. 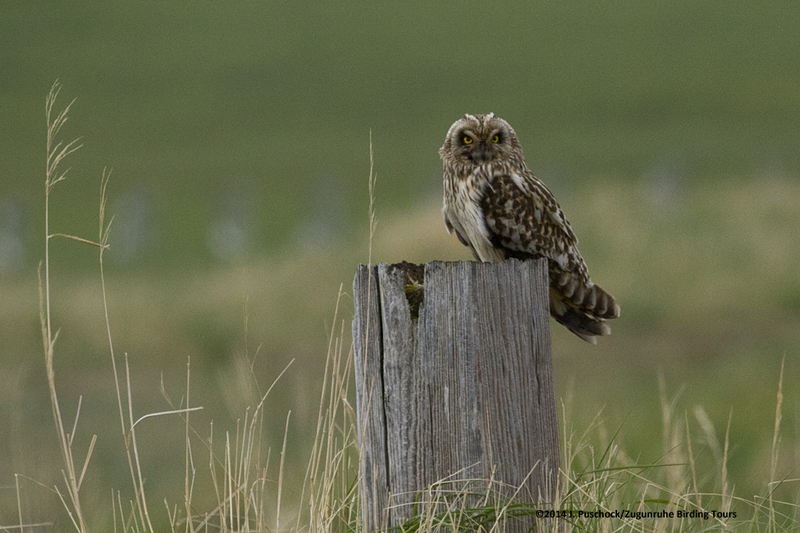 In the morning we checked out a few spots near town, had some quality time with a Short-eared Owl, and then headed out to Clam Lagoon. We didn’t find much to talk about. A male Common Merganser (American form) was the most noteworthy bird. We then went back to town for lunch and then finish packing. I was sharing a house with Thomas Kallmeyer and his girlfriend, Katie Heath. I walked into the dining room, and he said, “It would be cool to look out the window and see a Hawfinch or something.” I shared that I had a similar thought and had just looked out my bedroom window hoping to see the Common Cuckoo. Thomas then walks up to the window, looks to the right and fairly calmly says, “There’s a cuckoo out there right now.” He didn’t seem overly excited, so I question him, “Really? No!” (OK, I probably used a few more words than that, but they may not be printable here.) He affirms that there really is a cuckoo out there. Still not sure to believe him, I creep up to the window and look out. “No!”, I say. “It’s a different cuckoo!” Thomas and I both run for our cameras to document the sighting. We then head outside to get some photos unfettered by window glass. “Honey, there’s another cuckoo in the yard”, Thomas calls to Katie as he walks out the door. 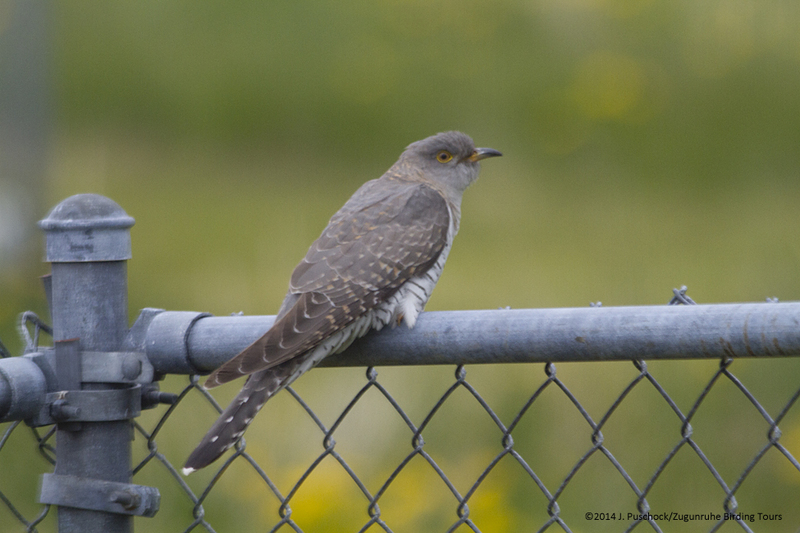 Eventually, the rest of the group is able to refind this bird, a gray morph Common Cuckoo. It is likely a female based on the limited amount of brown on the upper breast and sides of neck and probably a second-year bird based on the spotting on the upperside of the primaries. 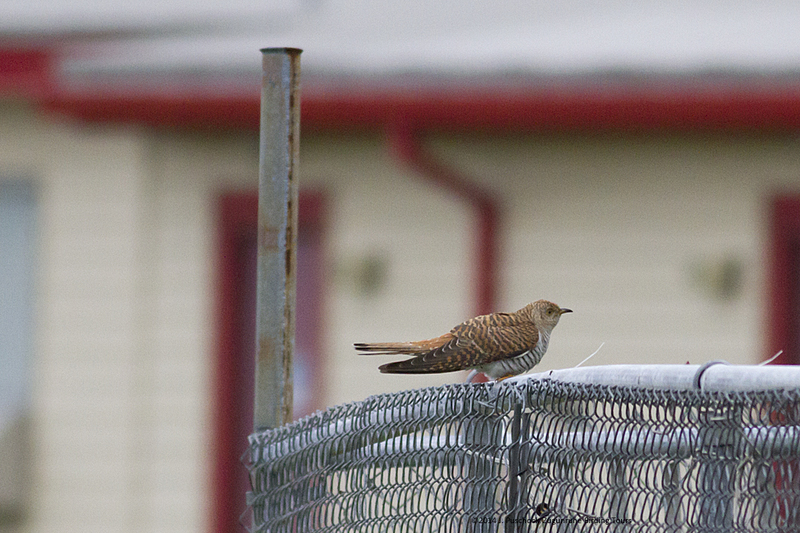 My reference material says that cuckoos usually undergo a complete or nearly complete molt, but this bird seems to be hanging on to those flight feathers. Correct me in the comments if I’m wrong. I was able to get the following photo a little later. Not too shabby. And that’s how the trip ended. After some slow days and bad luck, it went out with a bang. Always keep birding. Again, I want to say thanks to the crew of the M/V Tiglax. Thanks also to everyone on the trip for not letting the bad luck get in the way of having fun. Finally, I want to give a shout out to the people at Cotton Carrier for lending me one of their camera vests, which made biking with my gear easier.